This weekend Pack 552 is holding their annual pinewood derby. Last year the results were devastating. The winning cars clocked in at ~220 mph in scale speed. Tot4's car ran under 180 on all four heats. He was not happy with the results, and we are still trying to figure out where he gets his hyper-competitive streak. For Christmas we gave the boy a copy of "Building the Fastest Pinewood Derby Car: Speed Secrets for Crossing the Finish Line First!" The book has 10- 5-star reviews on Amazon, but wow, no way. While it is technically possible to follow all the rules, it is unlikely that the average Dad (that includes me) could execute all of the rules. The high tech design offered by the author requires very skilled execution with a variety of very specific tools and techniques. As a Project Manager that leads teams to build data centers, I lack nearly all of those skills. Rather than describe how the first car body was destroyed (while manually drilling the rear of the car to insert 3oz weights), I'm going to talk about the things that did work and that didn't require micrometers or feeler gauges. Yes, both are encouraged by the book. First - Keep the body shape simple and leave room for adding weights. Band saw experts can cut beautiful curves, sweeping, swooping, dipping, bending body lines. But the cars that won last year were basic wedges - low, and shaped at the front, then rising slightly above the rear wheels. We employed this style for Tot3 - she will be in the sibling / wildcat class and will likely have great speeds for a very simple design. Second - Spend a bit of time on the axles and wheels. In this case the book gives a couple of key tips about proper grinding, sanding and adding a slight back-angle to the head of the axle. I simply inserted each axle into a hand-drill and used a small file and scrap sandpaper to smooth out the burrs and polish the shaft. The head of the axle needs to be filed slightly out, away from the shaft, to reduce contact with the wheel. (I refuse to quote microns or degrees like the book does, besides I need a few trade secrets). Rolling the axles on a flat smooth surface did a pretty good job of identifying the "top" of each axle. Both cars were tested to see if they rolled straight. Applying weights to the body can be a tough call. The key is maximizing "potential" energy by mounting the weights in specific locations. Somewhere out there is a physicist that will describe that location... he was probably the dad of the author of the book. Probably the best tip in the entire book was the method to correct the problem when the car pulls to one side or the other (buy the book, or send me a note). The second best was to use graphite in the axles. The wheels were able to spin much smoother with graphite. The test is easy: spin the wheel with your finger and listen to the friction. Add graphite, repeat. Quieter = better = faster. Use a drill press and drill holes into the back of the car leaving enough clearance for the axles... 0.00125" clearance... check with micrometer, perfectly horizontal and parallel... "My God Jim, I'm just a country doctor." Krylon filler/primer - about $5 from Lowe's. You can spend a lot of time sanding your car, but this Krylon product fills most of the pores, sands in about 30 seconds, and takes a beautiful coat of color. Tape off the slot for the axles, spray, dry, sand... spray on final coat... perfection. Boy's car from Mars, "Blue Steel"
For the boy, weights were placed above the rear axle - and the weights became part of the body design. A wedge shaped weight covers a hidden, slide-in weight. At the weigh-in we simply slide out the lower weight, clipped off .2 ounces of excess weight and he was ready to go. (Did in mention that we had to cut a slot to hold the sliding weight, and that the top weight had screws just slightly larger than eyeglass hinge screws, and that I have hands the size of a gorilla? And, he wanted two tone paint with silver pinstripe and reflective metal canopy? And, that he expects to WIN)? Girl's car from Venus, "Ender"
For the girl, a simple wedge shape with secondary cuts on the nose for aerodynamics and the weights were added under the car, directly in front of the rear axle. Drilled 2 - 1 inch holes on the center-line, and added quarters for weights and a spot of glue from a hot glue gun to hold them in. We left the car slightly light, took, quarters, nickles and dimes and the glue gun to the weigh-in. Checked the weight, added a quarter (11 total) and hit it with a spot of glue - 4.95 ounces. She had a two-tone paint job and decals and the final clear coat destroyed an otherwise simple paint job. Both cars will do well on speed, and both are pretty good looking. His car took about 10 hours of hands-on effort, hers about 5. She has a good chance of winning the sibling wildcat class - which tend to be cars submitted for style awards. He is racing against 80 other boys. Applying the Billy Ball (Moneyball) principle, she is going to get the most production (success) for the effort (cost) applied. The Boy Scouts promote participation and having fun. That does not apply to the Pinewood Derby. Other Fathers (and some Moms) see this as a core line item for college entrance applications. Kids from these parents grow up to write books on how to make your car fast. Winners get to spike the ball and do their touchdown dance. Both of my kids were encouraged (OK, forced) to be present when I was working on the cars. We talked about the process, what worked, what wasn't going to work, what was going to be hard to do. They got to help on tasks that they could manage. 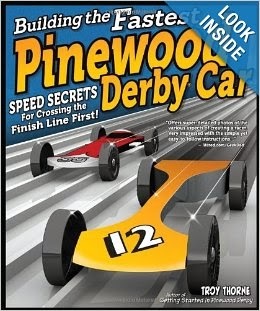 You can see the Pinewood Derby as a contest, or as a great chance to spend time with your kids.